The Inglenook sales office will be open this Saturday, September 5th from 1-4PM at Inglenook of Carmel. We will be closed Sunday, September 6th for the Labor Day weekend. For a long time the bigger the house the better, however that notion of bigger is better is long in the past. For sometime now, architects have been working to build houses for the way we live, what we actually need, and cut out the wasted space. This big idea is built around smarter, not bigger living. Here are a few reasons that make smarter living just good sense. Quality versus quantity. When money is not wasted on unused space it can be put to use in the quality of materials (thicker doors, better windows, and better insulation) and quality of design. More efficient living. Simply put, more quality build and less square footage cuts down energy bills. Designed for life. Renowned architect Ross Chapin designs the homes at Inglenook. Ross Chapin thoughtfully plans where every room, staircase, and built-in goes so that everyday living is maximized to its fullest. Smaller footprint on the environment. Smaller size and better materials have a lower environmental impact. Stop by this Sunday, May 31st to experience smarter living first hand. The sales office will be open 1-4PM. 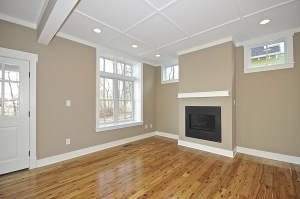 To schedule a private tour please contact us at 317.767.9760 or at info@landdevelopbuild.com. and experience the true sense of a pocket neighborhood. We are working away on the final few homes being built on the West side of Maple Drive. A custom Plumrose, Madrona, and two final Iris homes round out Inglenook of Carmel’s cozy pocket neighborhood. Each home is one-of-a-kind. We have truly enjoyed watching the homes blossom and the neighborhood grow. With twenty-seven different color homes we have built a beautiful “garden”. Even the garages are a work of art. Debuting at Inglenook, the Iris has been one of our most popular Ross Chapin home designs. The final Iris is nestled along the green space in Home Site #13. The Iris offers enormous flexibility in design alongside cottage comfort and charm. We have just put the cherry on top of this beautiful home with its freshly painted door. Stop by this Sunday, April 26th from 1-4PM to see it for yourself! We have some great events coming up in the next couple of months – porch parties, interior design classes, and more! Be sure to sign-up for our newsletter and follow us on Facebook to get the inside scoop on all of the fun! Stop by and see the latest happenings and Inglenook! The sales office is open this Sunday, April 26th from 1-4PM. To schedule a private tour please contact us via email at inglenookcarmel@gmail.com or via phone 317.767.9760. Tucked away off of 99th Street, Inglenook of Carmel is an intimate community filled with families, friends, and four-legged friends. In true pocket neighborhood fashion, Inglenook is designed to foster community. As our residents say, “When you turn into the entrance of Inglenook you are entering a special world. This is a true neighborhood”. Here chili cook-offs, neighborhood potlucks, and friendly conversations are a Friday night regular. Stop by this Sunday to see the Iris, the final piece to complete our cozy Inglenook pocket neighborhood. The sales office is open Sunday, March 8th from 1-4PM. To schedule a private tour please contact us at 317.767.9760. Priority Registration for news on the next Inglenook neighborhood. Wishing you a very happy holiday season to you and yours! Inglenook of Carmel will be open for private tours by appointment only Wednesday and Friday. Please call 317.76.79760 or email us at inglenookcarmel@gmail.com to schedule your private tour. We will be open regular hours on Saturday and Sunday from 1-4PM. The air is crisp, the leaves are changing, and the pumpkins are out! In celebration of our favorite time of the year and our newest Inglenook families who have moved in we are hosting an Inglenook Fall Porch Party! Find directions to Inglenook of Carmel here. Join us for some fall fun on the porches, apple cider, and Inglenook’s Inaugural Great Pumpkin Contest. If you can't make it to the upcoming Inglenook Fall Porch Party don't fear! Sign up for our newsletter to find out about Inglenook's latest news, events, and more here. Inglenook's sales office is open Wednesday-Friday, 1-5PM and Saturday-Sunday, 1-4PM. To schedule a private tour email us at inglenookcarmel@gmail.com or via phone at 317.767.9760. If you’re planning to stop by to talk shop with Casey, our builder, to tour Inglenook’s model Ellis home, or just to smell the roses – we’ve moved our office! Our yellow Ellis has sold and is now occupied! Our official Inglenook office is now in the brown Iris being built on the west side of Maple Drive. Stop on by, check out our new digs, and say hello! Our sales office is open Wednesday-Friday, 1-5PM and Saturday-Sunday, 1-4PM. To schedule a private tour please email us at inglenookcarmel@gmail.com or call us at 317.767.9760.